A screenset is a snapshot of the current layout of various views and windows in a project, including which windows are open, their size, position, zoom level and whether they are docked or floating. You can create up to 10 screensets per project and freely switch between screensets at any time. Screensets can be selected and edited from the Screenset module in the Control Bar, or with number keys 1-0 on your computer keyboard. Figure 242. 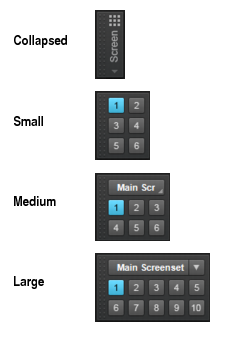 Screenset module sizes. Right-click the Control Bar and select Modules > Screenset. Figure 243. The Screenset module. 1 [screenset 1 name] - 0 [screenset 10 name]. Select screenset 1 through 10. Revert Current Screenset. Revert the current screenset to its last saved state before the project was saved. See To revert the current screenset to its last saved state. Lock/Unlock Current Screenset. Lock the current screenset to prevent any modifications. See To prevent the current screenset from being modified. Rename Current Screenset. Rename the current screenset. See To name or rename the current screenset. Duplicate Current Screenset to. Copy the current screenset to another screenset location (1 to 0). Select the target screenset location from the submenu. The selected target screenset becomes the current screenset. See To duplicate the current screenset. 1 [screenset 1 name] - 0 [screenset 10 name]. Duplicate the current screenset to screenset 1 through 10. Import Screensets from <source file name>.cwp. Import screensets from another open project. Any locked screensets in the current project are not overwritten. See To import screensets from another project. 1-10 buttons - . Select screensets 1 through 10. You can also press the 1-0 keys on the computer keyboard to select screensets 1 through 10. The active screenset button is highlighted.